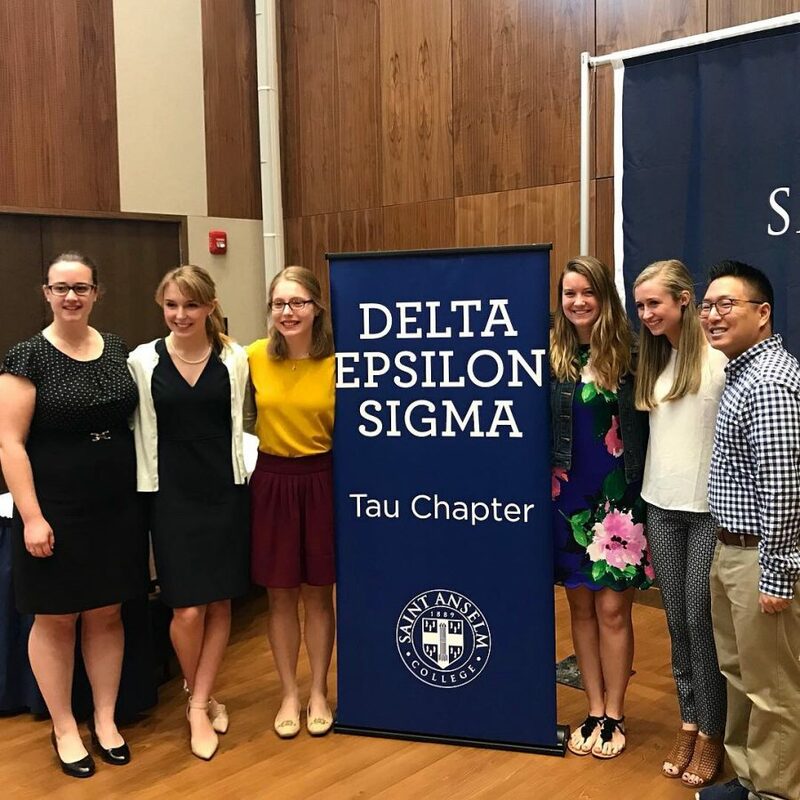 Students, family, friends, and faculty gathered on Sunday, March 31st in the Jean Student Center Auditorium for the Delta Epsilon Sigma Honor Society Induction Ceremony. In total, fourteen seniors and twenty-four juniors were inducted into the society’s Tau Chapter. The ceremony was preceded by a brunch in the Event Space and followed by elections for next year’s officers. Delta Epsilon Sigma was founded in 1939 as a collegiate honor society dedicated to scholarship, leadership, and service. There are 119 chapters of DES nationwide, and the Tau Chapter is one of the original 32 chapters. Saint Anselm College has inducted 691 students into the Tau Chapter. The ceremony began with welcoming remarks by Professor Derk Wierda, Chapter President. Father Peter Guerin, O.S.B. then gave the opening invocation. The invocation was followed by an introduction of the keynote speaker, given by the outgoing Chapter Student President (who is also the author of this article). The keynote address was given by alumna Bethany Cottrell. After Cottrell’s address, Professor Wierda and Dean Christine Gustafson, Chapter Secretary-Treasurer, led the ritual of induction and distributed membership certificates and pins. Brother Isaac Murphy, O.S.B., gave closing remarks and the closing benediction. Bethany Cottrell, the keynote speaker, graduated from Saint Anselm College in 2006 with a degree in psychology. Cottrell has dedicated her time and efforts to helping victims of abuse, particularly sexual abuse, as well as victims of human trafficking. Cottrell is the founder of Brigid’s House of Hope, the first safe house for victims of human trafficking in New Hampshire. She has also given back to the community in a variety of other ways, including serving as a volunteer co-coordinator for Toys for Tots, a board member for the Humane Society of Greater Nashua, and a Christmas shopper for the Front Door Agency Santa Fund. She currently serves as the Human Services Director for Merrimack County, where one of her responsibilities is to oversee the Merrimack County Advocacy Center in Concord. This year, Cottrell was named to the Union-Leader’s 40-Under-Forty List, which recognizes New Hampshire professionals who are giving back to their communities in meaningful ways. Cottrell’s address encouraged audience members to consider their “sentence”: their legacy and impact on their communities. She described how she found her calling working with victims of sexual abuse and human trafficking, an outgrowth of her passion for justice. She explained how her path was nonlinear; she initially had intentions of becoming a lawyer before connections and opportunities led her through a different doorway. Throughout her address, Cottrell encouraged the students in the audience to not be afraid opportunities, but rather to jump into them – even if they might not seem directly aligned with one’s plan. For example, while at Saint Anselm College, Cottrell conducted research on migraines and migraine management. While this research did not become a part of her career, the process was deeply personal – she herself suffers from migraines – and taught her valuable life skills which were transferable to her career. Cottrell concluded her address by sharing her own “sentence,” a declaration of self-authenticity and infectious dedication to one’s passion which sparks a light in others. She earnestly reminded each listener, however, to not get so tangled up in the lexicon of one’s sentence that one forgets to live out his/her sentence.